For those who have never used Photoshop, it can be really tricky to manage the photoshop levels. In this article I'll explain to you the levels in photoshop and you'll see that it's really easy and fun. For better understanding the photoshop levels, you have to image overlapping sheets stacked one above the other. Every sheet represents an element that can be for example a photo, a picture, an object, an effect, a background, a text and the set of all this elements will define the final image. Why to use the levels in photoshop? In this way it's really easy and direct isolate a single object and edit, hide or remove it, without change other elements of your final image. In the figure below you can see the photoshop section in which you can manage the levels in photoshop. In red I've highlighted the most important button that are used to manage the levels. 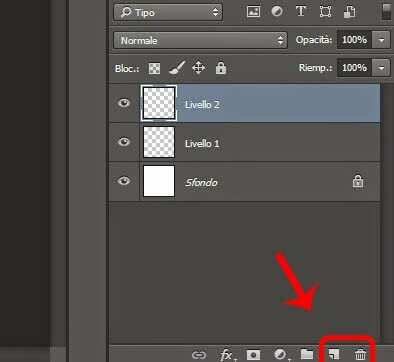 If you understand this two buttons, then you can manage the levels in photoshop. The first button on the left allows you to create a new level. Before you add a new object, you have to create a new level by pressing on this button. Instead, if you want to remove a level, you can click on the button on the right. You can also temporary hide a level simply by clicking on the eye next to the level you want to hide, You can also change the level priority simply by dragging and dropping the box of a level in the position you want: in this way elements that were on the top becomes background element.